I put all my daily necessities into a van of a moving company. The van, along with all the daily items, was exhibited. The items in the van were rearranged to make the work look like a home. 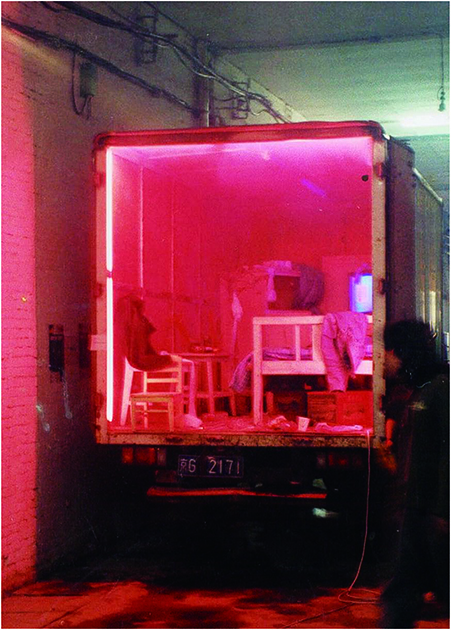 A large amount of pink tubes and burning incense were placed in the van. The motor of the van was on all the time. The air was filled with a mixed smell of carbon dioxide and incenses. Reality and virtuality make up a new real scene. Magritte is a name invented by me – the name does not specifically refer to anybody and it is a general term for all my real neighbors.